Well, not quite. It's 12:20 pm, my lunch time is almost over and I'm not ready for it to be over :( Days like these that I start counting down to the weekend. 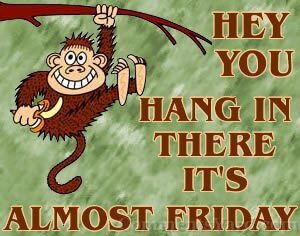 Fortunately for me--it is almost Friday! With the weekend coming up, I'm already thinking of what is ahead! :) Baseball, shopping, cleaning, studying and fun with the family. I do have a lot to do during the weekend, but its all mine!! Especially this weekend, being that its Mother's Day on Sunday-hehehehehe! I plan on doing nothing!! No cooking! No cleaning! Nothing!!! All I ask for is that my hubby & kids take care of any food prep and clean up afterwards-keeping my fingers crossed that it happens!